Web Engineering is going through several major changes. New promising application fields related to the Web such as the Semantic Web and Web Services, and its combination, Semantic Web Services, are transforming the Web from a mere repository of information into a new vehicle for business transactions and information exchange. However, the lack of integration among different Web Applications such as Web Portals and web services is hindering the potential leverage of the Web. 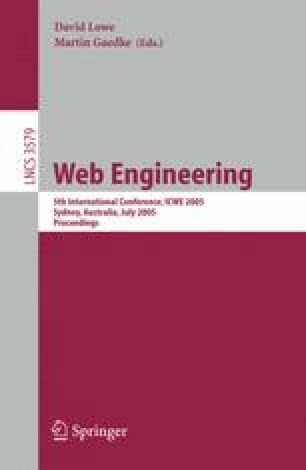 In this paper, we present a novel approach for integration in Web engineering based on Semantic Web Services. Our approach enables the combination in a Tetrahedron of a fully-fledged architecture consisting of three layers. An application integration layer, a second layer based on goal-oriented and intelligent user-interaction and finally, a common middleware platform for Semantic Web Services. We describe the implementation of our architecture and its benefits by achieving full integration all over Web applications.